The streaming media encoding universe has evolved into a complex space with multiple, often intersecting markets. In this overview article, I'll identify the most critical market segments and discuss one or two key products within each market. My criteria for product selection are unavoidably subjective; in most instances, I chose the products that I knew the best and have worked with the most, and know to be competent at their intended tasks. This doesn't mean that the products that I didn't choose aren't worthy; rather, it just means that I wasn't as familiar with them as the products that I wrote about. Let's start with on-demand and live hardware products, and then work our way to software and cloud- based encoders. With entrants from industry veterans such as Envivio, Inc.; Digital Rapids; Cisco; and others, there are lots of worthy products in this category. That said, choosing the representative product, Elemental Server, was still an obvious choice; it's the fastest H.264 encoder that I've ever tested, with very good quality. With users such as ESPN and multiple Olympic broadcasters, it's clear that I'm not the only one who thinks so. The Linux-driven server incorporates two six-core Westmere-class Intel Xeon CPUs and two NVIDIA Corp. GPUs, and it has an MSRP of $25,950. Though operation is browser-based, there's a lot of logic built into the interface, including error checking, which helps prevent launching jobs that will fail after processing begins. Elemental Server's deinterlacing function is outstanding -- it's a key quality consideration for those distributing interlaced-source footage. Closed caption support is quite extensive, including the ability to embed subtitles or create subtitle files (SRT, SMI, and TTML files) for MPEG-2 transport streams, Smooth Streaming, Flash, and Apple iOS devices. Server is kind of a one-trick pony; its Windows Media output is subpar, and it doesn't output VP6 or WebM. But if high-volume, high-quality H.264 encoding is your need, Elemental Server should be atop your short list. The Elemental Server—the one to choose for high-volume, high-quality H.264 encoding. I could have gone two ways with this category: choose a big-iron, on-premise encoder for periodic or continuous broadcasts, or highlight a portable unit for live event broadcasting from the road. I chose the latter because of familiarity with the market and specifically the product that I chose, the Digital Rapids TouchStream portable encoder. One thing all live event producers can agree upon is that less is more when it comes to equipment that you have to carry to the event and then back home. Since you can run the shoe-box-sized TouchStream via its touchscreen interface, this means that you don't need to pack a monitor or keyboard, as you would with competitive units from other vendors. Digital Rapids offers an extensive range of models that input signals from composite SD to HD SDI and can output H.264, VP6, MPEG-2, and Windows Media Video in single stream or adaptive streams suitable for Smooth Streaming, Dynamic Streaming, and HTTP Live Streaming. The Windows-based software is easy to use and functional, with useful adjustments for brightness, contrast, saturation and tint, special and temporal noise reduction, and audio volume controls. On the other hand, the template creation software is overly complex, but once they've create their presets, most users won't need to use this software. Most importantly, the H.264 and WMV streams I created during my testing showed uniformly good quality. TouchStream units aren't cheap, but if you're looking for a high-quality, highly portable live encoder for road productions, TouchStream is a great choice. With our hardware categories addressed, let's move to software. 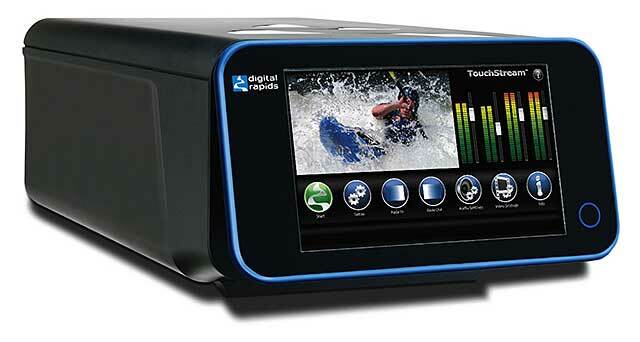 Digital Rapids TouchStream is easy to use and highly portable, and it outputs high-quality video. Though Apple Compressor hasn't had a serious feature or interface update in roughly forever, it's the encoding tool of choice for most Final Cut Pro X (FCPX) editors, primarily because of cost ($49.99) and the convenience of being able to export directly from the FCPX timeline. Compressor's strong points include rock- solid compatibility with all Apple devices and relatively competitive encoding times, in part courtesy of Apple's Qmaster, which lets Compressor run multiple encoding instances on multiple core computers. Compressor also offers a very simple clustering function, which allows multiple users on a LAN to offload encoding chores to other computers on the network that have Compressor installed. Negatives include lack of support for the H.264 High profile, which is perhaps why Compressor's quality trails that of other encoders at more aggressive data rates. Compressor also takes Apple's normal xenophobic view of formats that don't run on iOS devices, with no support for either VP6 or WMV. Also lacking is watch folder operation, limiting Compressor's ability to share encoding chores with others in a workgroup who don't have Compressor installed. Apple Compressor’s (very) familiar interface. The Japanese term Kaizen refers to the practice of making many small but continuous improvements in a product over time, and it's the perfect term to describe how Adobe has improved Adobe Media Encoder (AME). Each version incorporates meaningful interface enhancements; in CS5 Adobe simplified watch folder operation and in CS6, Adobe made presets easier to find and apply. Plus CS6 brought parallel encoding, a huge benefit for those producing for adaptive streaming. Many other features make AME the encoder of choice for Creative Suite output, including the ability to export to AME from Premiere Pro and After Effects, and the ability to directly load Premiere Pro sequences and After Effects compositions without opening the originating programs. Format support is also extensive with multiple presets for Flash, Android, and iOS output, with VP6 support on the Windows and Mac platforms, and Windows Media output on Windows installs. H.264 quality is also very competitive, with watch folders available for shared use in a workgroup. 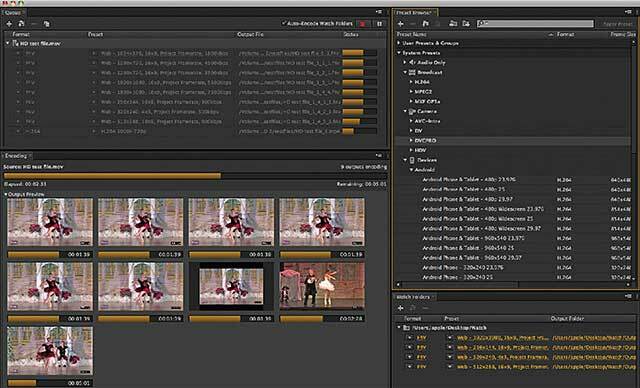 Adobe Media Encoder CS6 brought improved preset usability and parallel encoding. Sorenson Squeeze is another product that just keeps getting better. With version 8.0, Sorenson added support for the x264 codec, which delivers better quality than the older MainConcept codec, which is still included. The newest version, Squeeze 8.5, adds accelerated encoding for single files plus unparalleled support for adaptive streaming, including presets for HTTP Live Streaming, HTTP Dynamic Streaming, Smooth Streaming, and DASH, as well as a foolproof interface that ensures consistent key frame intervals and audio parameters in all files in an adaptive group. Other Sorenson products also add significant value to Squeeze. For example, Squeeze users can send encoding jobs to installations of Squeeze Server for high volume, industrial strength encoding, with client review and approval and video publishing easily accessible in Sorenson 360. 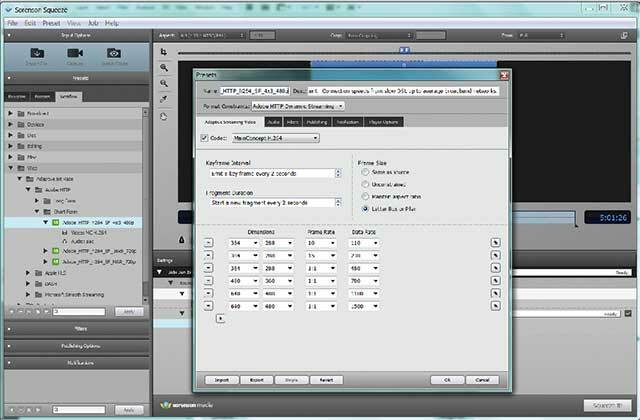 Squeeze also outputs all relevant streaming formats, including WebM, VP6, and Windows Media and intermediate formats such as Avid DNxHD and ProRes. For most streaming formats, Squeeze offers an extensive range of configuration options that are ideal for compression experts, with presets to simplify encoding for nontechnical users. Sorenson Squeeze’s adaptive streaming preset for HTTP Dynamic Streaming. Harmonic, Inc.'s Workflow System (WFS) is a soup-to- nuts, on-demand encoder that will retrieve your files from a variety of remote locations; encode them to a range of streaming, intermediate, and playout formats; check the files for quality and conformity and deliver them over FTP, HTTP and CIFS. 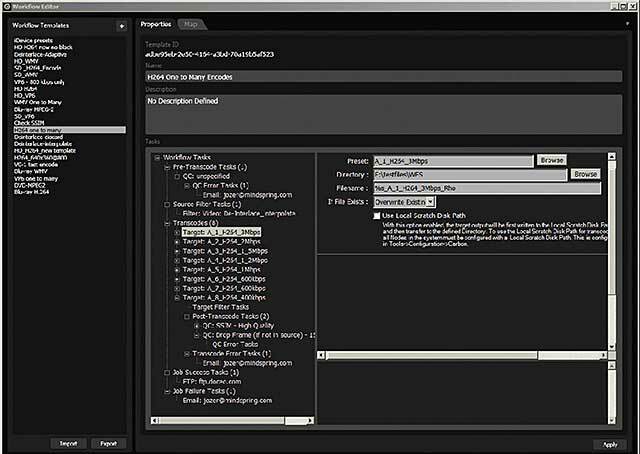 As the name suggests, WFS is a task-based engine that controls multiple other Harmonic modules, including ProMedia Carbon (formerly Carbon Coder) and the Rhozet Quality Control System (QCS). Carbon has long been my go-to encoder for high-volume, high-quality, multiple-format encoding, though its performance has slipped recently compared to its peers. However, the ProMedia Xpress software that I recently beta tested was the fastest software-only encoder I've seen by a wide margin; it will likely restore Carbon to the top spot in the near term. Harmonic's QCS program has all the bells and whistles of its competitors, and it can be used both pre-encode for file triage and quality control checks and postencode. However, what truly separates WFS from its closest competitors is sheer usability. While perhaps not as programmable as Telestream Vantage, for example, it's much simpler to use, and it's much more accessible for nontechnical users. 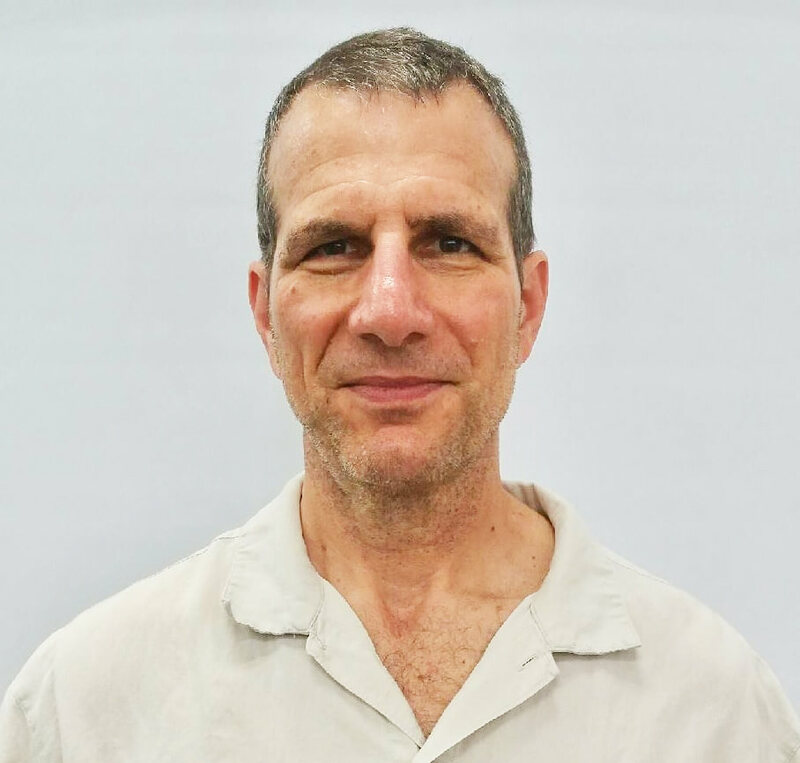 Of all the categories discussed here, the enterprise encoder market should see the most upheaval over the next few months, as virtually every vendor in the space, including Digital Rapids, Harmonic, Sorenson, and Telestream, release significant updates or new enterprise- oriented products. So stay tuned. 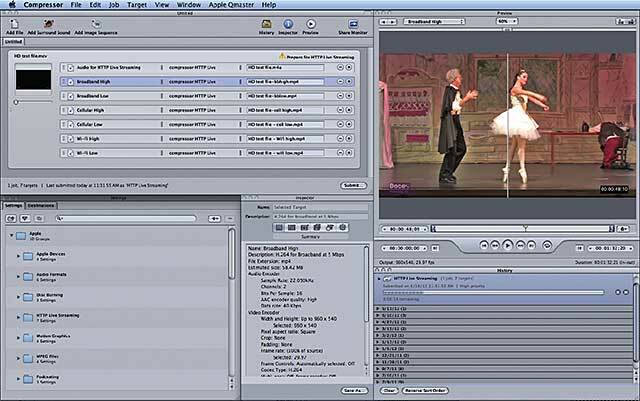 Harmonic WFS: Creating a workflow with pre-encode and postencode quality control checks. Usually, it only takes about 5 minutes into your first video-only webcast before you start thinking, "Gosh, this would look really great with titles for the speakers," and "What the heck am I going to broadcast during breaks or intermissions?" Well, you can spend thousands on hardware that can incorporate these elements, or you can buy Telestream Wirecast, which starts at $449 and lets you add titles to your videos, play back hard disk- based videos and much, much more, including switching between multiple cameras. 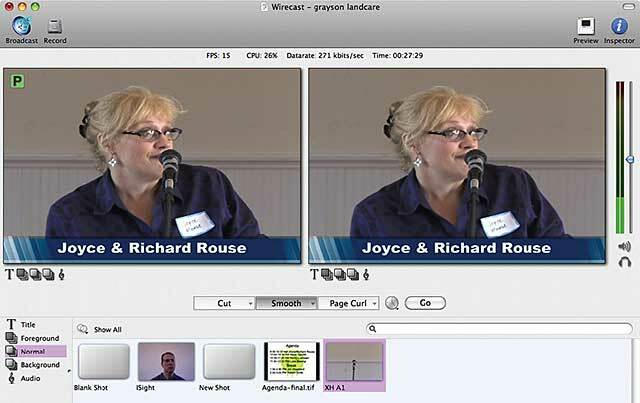 For example, you can broadcast the screen of any computer on the same network as the Wirecast capture station, a great feature for software training or presentations. Wirecast also includes live chroma key capabilities which the Pro version of Wirecast ($995) complements with 3D virtual sets. Broadcasting a sporting event? Wirecast Pro also includes an integrated scoreboard. Available for both Macintosh and Windows, both versions can produce files for Flash and QuickTime broadcasting, while the Windows version can also output Windows Media Video. Wirecast let me add simple titles to this webcast and post the agenda slate during the intermissions. Wowza Media Server was one of the first products to transmux incoming H.264 streams into formats suitable for delivery to a range of devices. Wowza Transcoder takes this one step further, transcoding a single incoming high-quality stream into multiple output streams for adaptive streaming, with minimal latency. This solves two very major problems for live streaming producers, encoding density at the event and limited outbound bandwidth from the event. Specifically, assume that an event producer wanted to distribute six adaptive streams at 2.5Mbps, 1.8Mbps, 1.4Mbps, 1Mbps, 600Kbps, and 300Kbps. This would typically require at least two encoding stations on site, which is expensive and adds to the transportation and setup burden. Getting the streams out of the building would also require 7.7Mbps of outbound bandwidth for the streams, plus some overhead. With Wowza Transcoder, event producers can broadcast a single 2.5Mbps stream to the remote server, where it can be re-encoded into the planned adaptive streams. Server capacity can be spun up as required, and the outbound bandwidth requirements are cut by 66%. Transcoded streams can be delivered as adaptive bitrate files using Flash RTMP/HTTP Dynamic Streaming, Apple HTTP Live Streaming, and Silverlight Smooth Streaming, or as single bitrate stream over any Wowza Media Server 3-supported protocols. Wowza Transcoder lets event producers broadcast a single stream to the remote server, where it can be re-encoded into multiple streams. Cloud encoding is the least familiar category to most readers and -- to be honest -- to me as well. I have worked with several clients who use Encoding.com, my cloud encoding platform of choice, so I am familiar with its workflow and encoding tools. 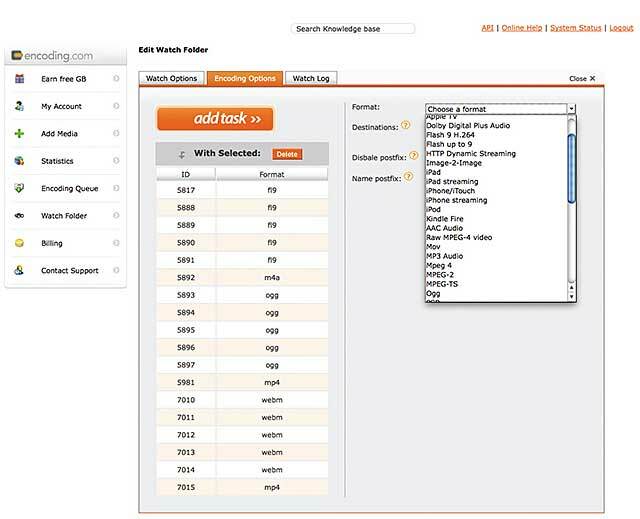 In addition to an application programming interface (API), Encoding.com works with watch folders, so you don't have to hire a programmer to start encoding. The service supports most relevant codecs and adaptive streaming formats with extensive presets presented in a logical interface for easy customization. And you can upload a file to check out the service, though with a 100MB limitation, you really can't test quality. Speaking of quality, how does Encoding.com's quality and performance compare to other services such as Zencoder? I honestly don't know because I haven't run any comparative tests. As upload bandwidths increase and the velocity of relevant formats continues to accelerate, cloud encoding will gain in importance and will be a market to which we allocate more reviewing resources over the next few months. Encoding.com supports most relevant codecs and adaptive streaming formats. Hardware? Software? A workflow system? What are the advantages to each? For those not sure where to start, look here first. Professional-level live video streaming doesn't have to be complicated. Wirecast works with a variety of partners, and it's a pleasure to use. Yes, there is a way to produce great-looking YouTube videos every time. Read on for expert advice and test results.